The War of the Spark expansion contains a planeswalker with a previous ability which almost broke the game. Wizards of the Coast is shaking the foundations of Ravnica with 36 Planeswalkers in the MTG War of the Spark expansion. The power coming to each guild is game-changing—potentially game breaking. In MTG Arena, House Dimir has dominated in Constructed ranked play. Blue players have long been shunned with memes and jokes but now top the rankings with Esper and Dimir control decks. Planeswalkers leading the charge in these decks are Teferi, Hero of Dominaria, Karn, Scion of Urza, and Tezzeret, Artifice Master. 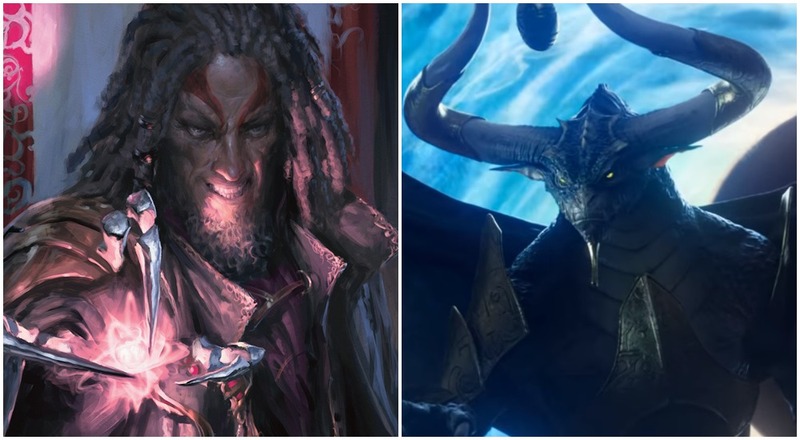 Teferi and Karn are from the Dominaria set, Tezzeret is Core Set 2019. Both sets will rotate out of standard, but not until fall of 2019. With the addition of War of the Spark expansion to the Ravnica set, Esper and Dimir control decks are heading towards a new level of dominance. Not every planeswalker will be a mythic rare, however, all will have static abilities. Upon coming into play on the battlefield, static abilities are always on. Affinity is a previous Magic: The Gathering mechanic which allows permanents (in this case artifacts) to reduce the cost of a spell. Previously in MTG, the ability “Affinity” practically destroyed the metagame during the Mirrodin Block set. 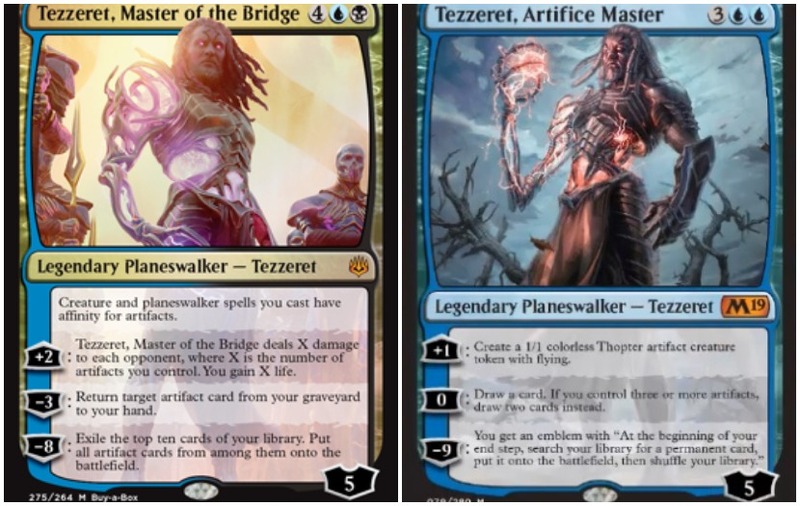 By combining Tezzeret, Master of the Bridge with existing Dimir and Esper control deck planeswalkers, things could get ugly in Constructed. Many MTG Arena players complain about control decks lacking win conditions. Tezzeret’s static ability, however, will open the door for a host of win condition cards which can be cast for a fraction of their mana cost. Tezzeret, Master of the Bridge might also work in mid-range creature decks using a new War of the Spark mechanic. The ability “Amass” creates a 0/0 Zombie Army token if no armies exist and place a +1/+1 counter on the token. If armies do exist, no tokens are created but the existing ones in play receive a +1/+1 counter. 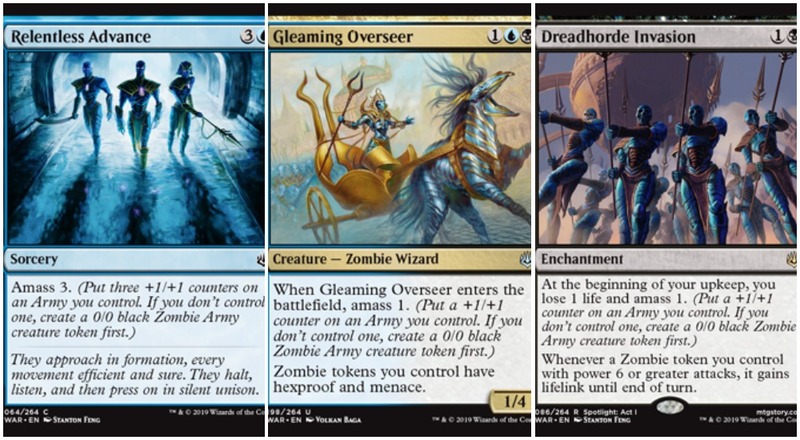 Spoiler MTG War of the Spark amass cards with potential are Gleaming Overseer, Herald of the Dreadhorde, Dreadhorde Invasion, Relentless Advance, and Lazotep Plating. Existing artifacts which would pair well with Tezzeret, Master of the Bridge for either control or creature decks are Sorcerous Spyglass, Treasure Map, Primal Amulet, Fountain of Renewal, and Skyscanner. Spoiler artifact cards for War of the Spark include Iron Bully and God-Pharoh’s Statue. Tezzeret, Master of the Bridge planeswalker will be available in the War of the Spark Ravnica expansion, set to release on April 25, 2019, in MTG Arena.